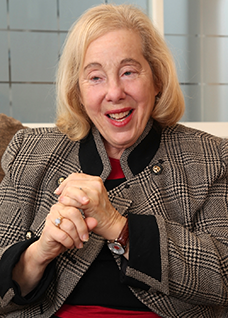 BOSTON—Rosabeth Moss Kanter, the School’s Ernest L. Arbuckle Professor of Business Administration, received an honorary doctor of humane letters degree at the University of Michigan’s commencement exercises on Saturday, May 4. Kanter has coauthored or coauthored numerous articles and 18 books, including Men and Women in the Corporation, The Change Masters, Confidence, When Giants Learn to Dance, and SuperCorp. She was editor of the Harvard Business Review from 1989 to 1992. In 2005, she co-founded and continues to serve as chair and director of the Harvard University Advanced Leadership Initiative, which is designed to enhance and leverage the skills of highly accomplished, experienced leaders who want to apply their talents to solve significant social problems, including those affecting health and welfare, children, and the environment, and focus on community and public service in the next phase of their careers. Both Forbes magazine and the Times of London have listed Kanter among the 50 most powerful women in the world, and Thinkers 50 ranks her repeatedly among the most influential business thinkers globally. Among many other accolades, Kanter has previously received the Academy of Management Distinguished Career Award, the Association of Leadership Professionals International Leadership Award, and 23 honorary degrees.